Gawler Airfield Squadron recently hosted a visit by RAAF Officer Cadet and former AAL Officer Lachlan Johnston. Lachlan has been a Second Officer at the Squadron before joining the Royal Australian Air Force in April. Lachlan recently graduated from the RAAF’s Officer Training School at RAAF Base East Sale and has been attached to 10 Squadron at RAAF Base Edinburgh. 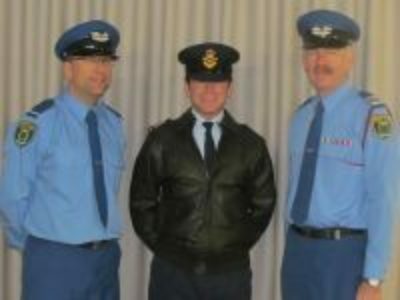 He commences his pilot training at Tamworth, NSW in October. The cadets were thrilled to have their ‘old’ officer back in his RAAF uniform. Lachlan spent around 30 minutes answering questions from the cadets about life in the Air Force and the aircraft he has flown so far. The cadets were very interested in his experiences with 10 Squadron where he is attached to Crew 6 to assist the crew in their duties. All cadets, Associate Members and Officers wish Lachlan all the best with his pilot training.